One of the better known characters in the Batman universe no doubt is Catwoman, the devious female heroine (or villainess, depending on who you ask) who is also known as Selina Kyle. Actually, Catwoman’s alter ego is a notorious thief, proving this lady is not afraid to play dirty in order to achieve her goals… And this is something that’s reflected in her fighting style in the Injustice 2 gameplay video below, in which she ruthlessly uses her whip against another DC character, none other than the Joker’s sidekick Harley Quinn. 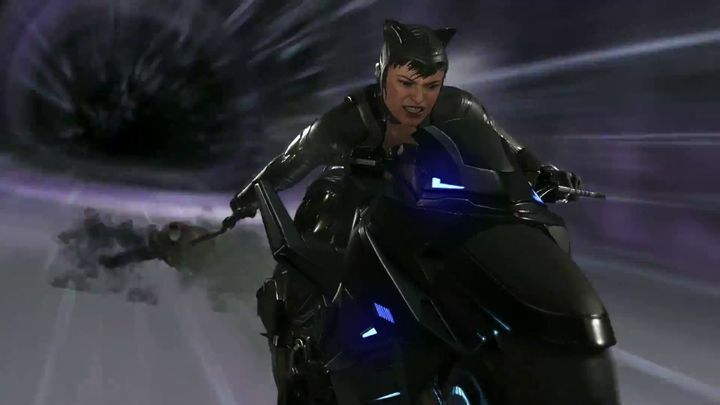 Catwoman also shows off some of her other tricks here, and also on display is her powerful finishing move, in which she uses her bike and whip to devastating effect. Catwoman goes toe to toe against Batman himself here too, proving she will be one mighty contender in Warner Bros. upcoming fighting game. Injustice 2 is a sequel to the 2013 Injustice: Gods Among Us and is being developed by Netherrealm Studios, the team behind the superlative Mortal Kombat series of video games. In the game players will have a big selection of DC characters to play as, including the likes of Catwoman, Black Adam and Aquaman. The game is slated for release next month. Note: Injustice 2 will be released on May 16, 2017. Available on PS4, Xbox One and mobile devices.